Following the completion of the new, state-of-the-art facility in nearby Nursling, Hughes and Salvidge were chosen to deliver the demolition of this landmark selection of buildings in Southampton. The site was surrounded by residential homes and adjacent to the HMRC offices, therefore, traffic, noise and dust management were paramount for the successful delivery of the scheme. 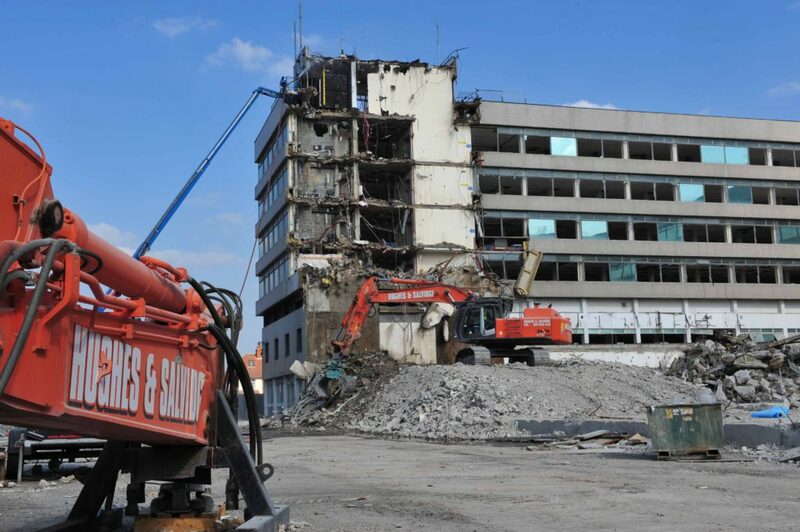 The works were carried out over a 36-week period and included soft-strip and high-rise mechanical demolition of several large scale, multi storey buildings. Hughes and Salvidge utilised our group offering to provide the client with the complete project cycle package: demolish, crush, reuse, recycle. We were able to make significant cost savings for the client as we managed recycling, processing, resale and disposal of all demolition arisings in house. H&S Metals processed over 60t of non-ferrous metals – This included cooper, aluminium and batteries with a net worth in excess of £85k. K&B Crushers processed over 35,000m³ of concrete and hard-core which was then either used to backfill the site, left on site (as requested by the client) or sold on to credit the client/contract. Aasvogel Waste Management processed all waste, maximising skip loads to reduce traffic movements – In total over 1000t of waste was removed and processed. Environmental preservation is key within our offering and on this project we achieved an outstanding recycling rate of over 99% with less than 1% been sent to landfill. Our project planning highlighted and mitigated all possible issues ensuring this project was completed safely and on programme.